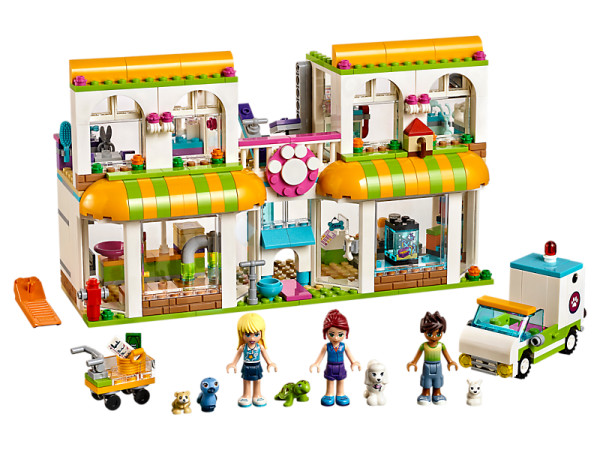 Includes Stephanie, Mia and Liam mini-doll figures, plus Mimì the bird, Harry the hamster, Lady the poodle, Bubbles the turtle and Mini the bunny figures. 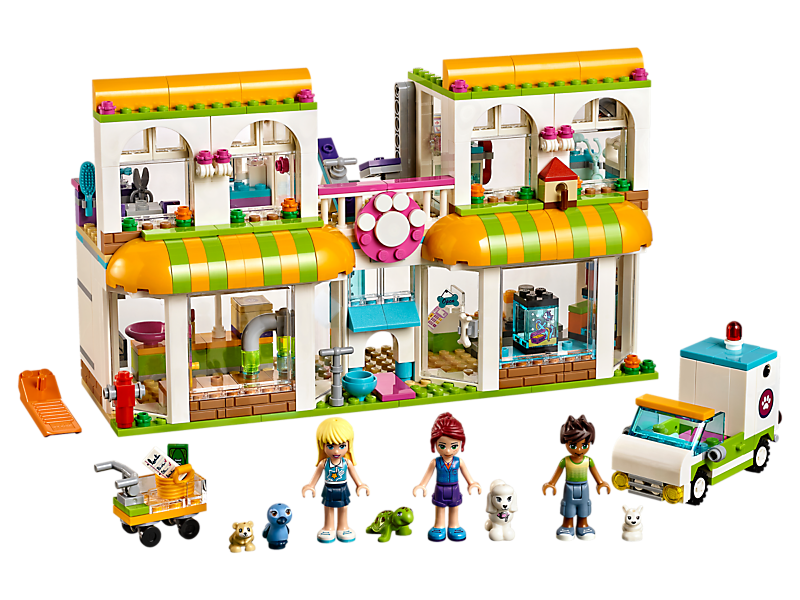 Features a 2-story building with a pet shop downstairs and a vet clinic, pet grooming parlor and an animal playground with seesaw upstairs, plus a mobile grooming van and delivery cart. Pet shop features special animal entrances, fish tanks, hamster tubes and a cash register. Vet clinic features an examination table, weighing scales and a sleeping area. Accessory elements include a mirror, scissors, bottles, basket, brush, hair bows, cookies and a money bill. 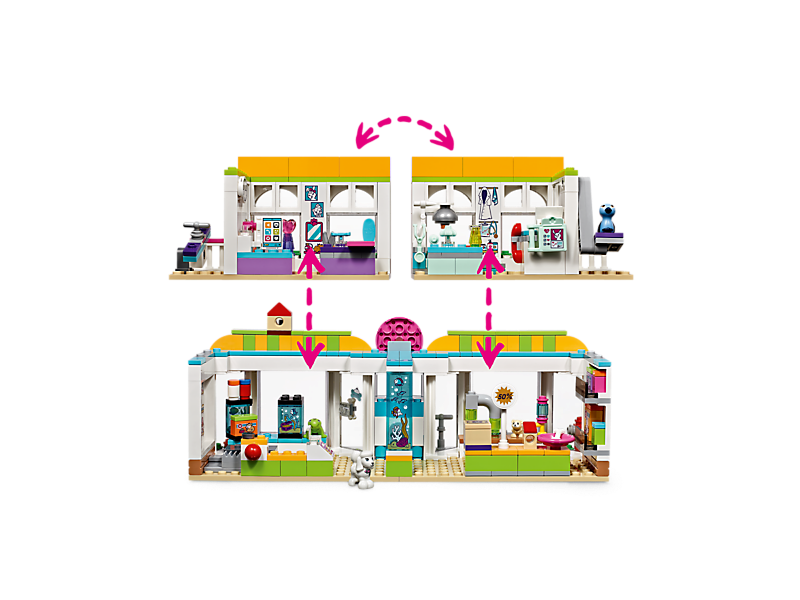 Explore all the amazing pet food and accessories in the pet shop, have a look at the fish and let Harry run through the hamster tubes in this detailed LEGO® Friends set. Find the special pet-sized entrances, made especially for animals only! Put Lady on the scales in the vet clinic, then settle her down for a rest to get better. Drive out in the mobile grooming van to make all Heartlake City’s pets look perfect, or bring them back to the grooming parlor for some extra love and attention. Heartlake City Pet Center measures over 5” (14cm) high, 9” (25cm) wide and 2” (7cm) deep. Grooming van measures over 1” (4cm) high, 2” (7cm) long and 1” (3cm) wide.